Everyone remembers the first time they got to do some go-kart racing. Its kind of mind blowing how you can have so much fun with so little horsepower. Owning a golf cart is a similar kind of deal, lots of fun, packed into a simple and affordable package thats easy to maintain and operate. 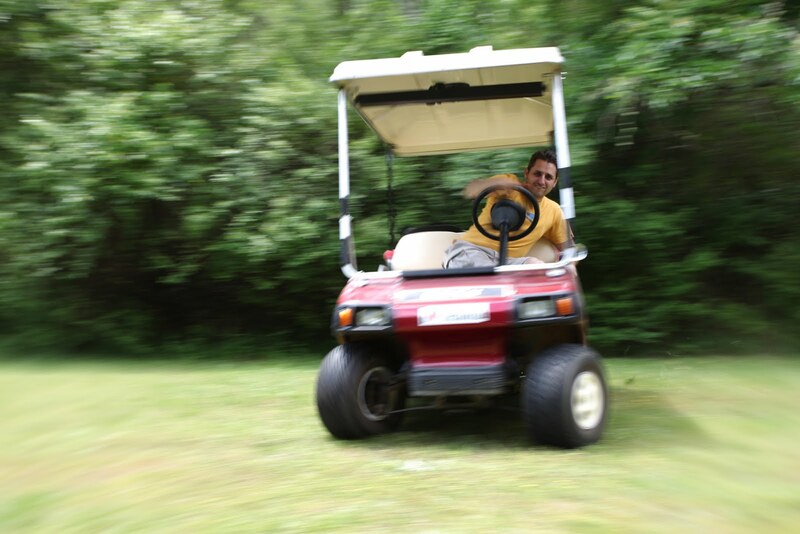 Lets take a look at the rapidly growing golf cart trend thats taking America and its suburban communities by storm. I originally intended this to be a fluff piece - just some silly photos of me arsing around in the golf cart. Then it struck me how these things have grown to be so popular in the last few years. So we've got fluff plus some statistics! 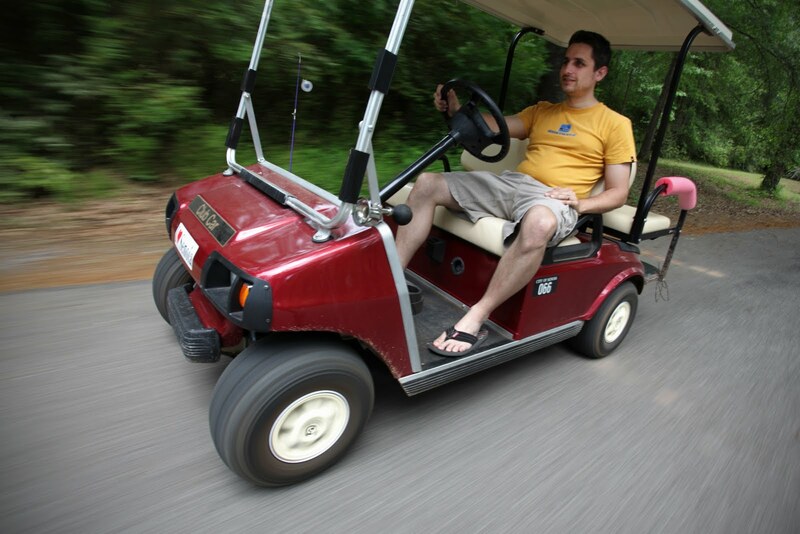 golf cart sales will reach $938 million in 2008 according to Packaged Fact research... that places the total units sold in 2008 at 120,000 to 160,000 depending on the average price that is used for the price of each Golf cart. My town, Senoia, which is also home to Top-gear USA host Rutledge Wood also has a golf cart friendly feel. Yes Rutledge has a golf cart too (all the cool kids do these days). None of the major state highways come through town, so the roads are all quiet. Any road in the city with a speed limit of under 35mph is considered part of the golf cart zone and the city has started building several multi-use trails to make short cuts for the golf carts. Its easy to see the appeal, my Club Car costs about 5 cents a mile to operate, a small fraction of what even an "economy car" costs to run. Its electric operation is hassle free, and the breeze on a summer day negates the need for air conditioning. Even on a humid 90 degree day, with the windshield removed the airflow keeps the ride pleasant, and there's no hot greenhouse feeling when you get back to the vehicle to go home. Recently State and Federal tax credits also furthered the appeal by making them even more affordable. In the Peachtree City area a large number of dealerships have sprung up reconditioning golf carts fresh off their golf leases. Whole fleets of hundreds of carts are bought, stripped, refurbished and sold in like-new condition for between $3000 and $4000 (before tax credits) the buyer can have it painted any color they want as part of the deal. The city requires a one time (for the life of the vehicle) fee of $15 for a sticker to register the cart. After that, no more taxes, no more fees, no insurance required, just happy motoring. Learn how opposite lock works while trying to stay in the golf cart. So now you know a little about this vehicular phenomenon. Racefriv is going to record a race between me and my lowly golf cart and Ish driving a street car of his choosing - in true Top Gear fashion. We will race from my house to some other place in Senoia, with me using the short cuts and Ish going the long way around town observing all relevant speed limits and highway laws. Anyone else we can rope in to help will record the momentous occasion on video for your entertainment. Riding a golf cart can definitely be a blast! It does kinda deliver the same experience as go-karting, though it is a little different and maybe a bit slower. And I do understand the appeal, since it's a low-cost and similarly fun alternative to karting. As for the safety concerns, well, as long as you know what you're doing, it shouldn't be a problem. Since I'm a devoted poker player,https://www.jetwin.com/en-us/sports I was constantly interested by the clay poker chip plaques I would see them pushing around on those James Bond motion pictures.